One of my favorite Tsukudani shop at Tsukiji Market is Suwa Shōten. It is in the outer market (jōgai). The shop is easy to find as there are large square and round aluminum vessels holding the sweet, soy seasoned seafood, usually small fish or shelled clams, and sea vegetables. Sometimes you will find meat products as well, but not much of it to be found at Tsukiji Market. If you walk by and this auntie is working behind the counter, you are in luck, as she speaks English, fairly well. Tsukudani originated in Tsukuda-jima, which is an island that is very close to Tsukiji Market. 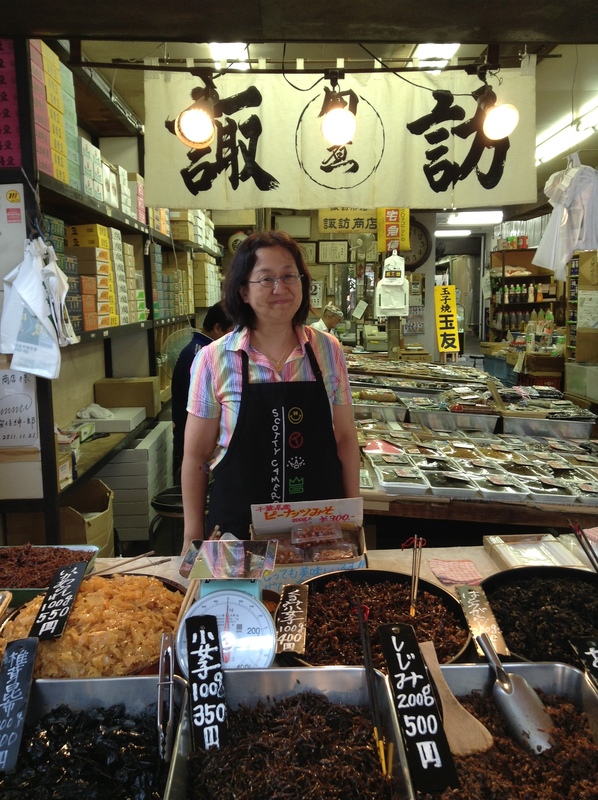 The name, Tsukudani, is made up of the place name, Tsukuda, and ni, for simmered goods. This is why Tsukudani should always be capitalized. 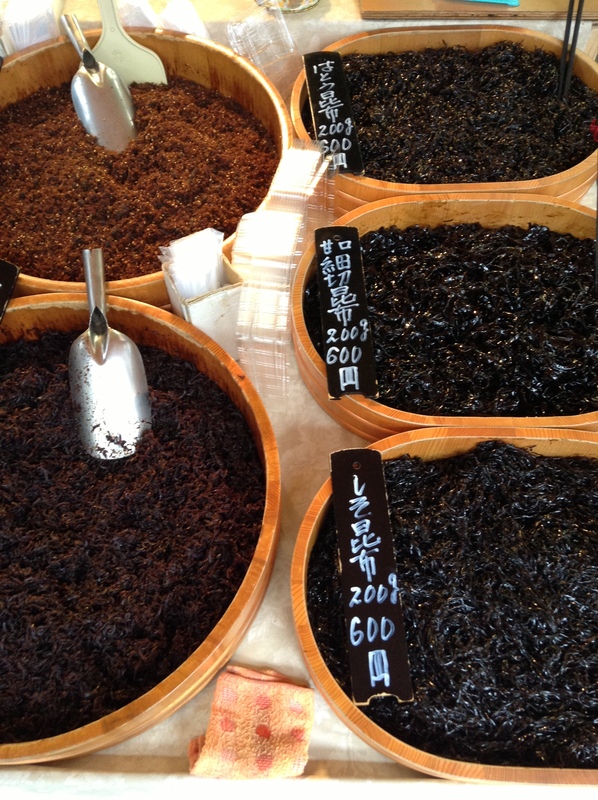 Tsukudani originated as a way to preserve the seafood and sea vegetables. It is very intense in flavor as it is quite salty and sweet. The simmering sauce is often made up of soy sauce, hence the dark color, mirin, and sugar. Tsukudani is so richly seasoned that it should be eaten with rice. Usually a small spoonful on a bowl of rice, or as a stuffing for omusubi (rice balls). Not all Tsukudani is dark in color. 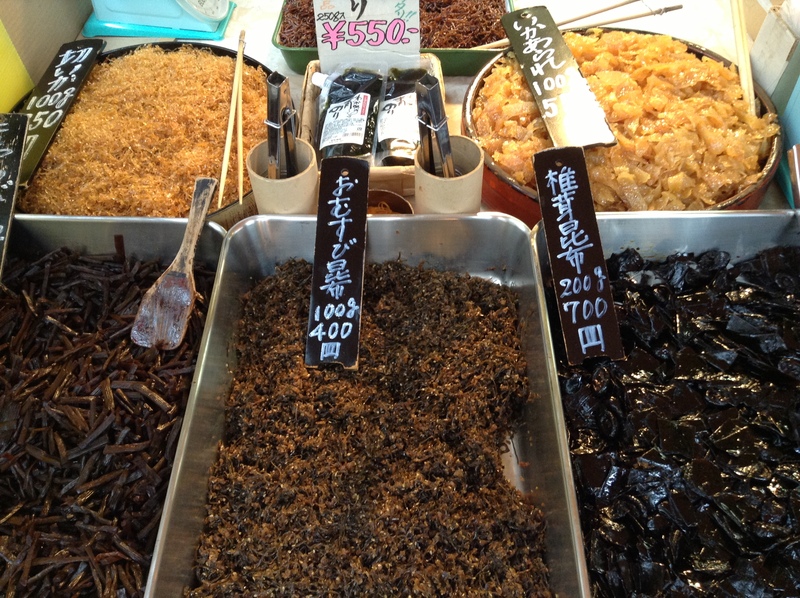 On the top left, the golden-hued ika-arare is sweetened shavings of dried squid. Up front, from left to right, shiitake (formerly dried) and kombu, konago (sand lance), and shijimi (Corbicula clams). 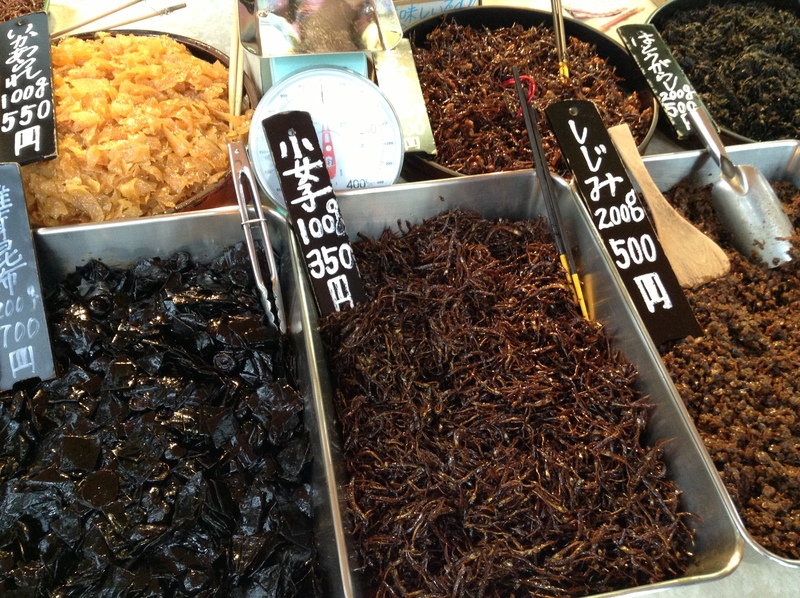 On the top left in this photo is kiri-ika, also sweetened, dried julienned strips of squid. If you are curious to try the beef Tsukudani, I highly recommend Asakusa Imahan’s version. It is available at many depachika throughout the city. Arigato! Have you been to this shop? I don’t think we stopped by when we visited Tsukiji.